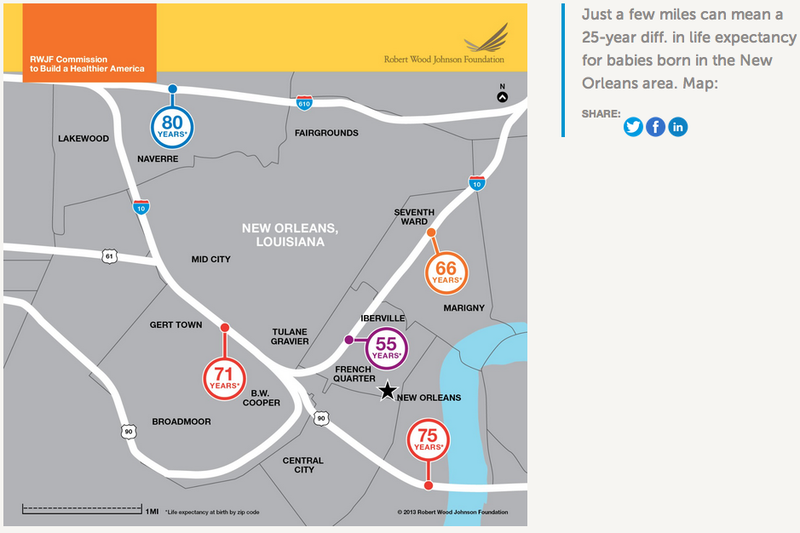 How does poverty affect life expectancy? How does lack of education impact life expectancy? 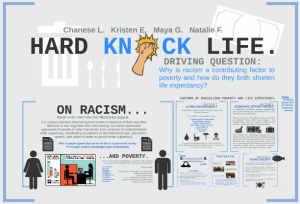 Why is racism a contributing factor to poverty and how can both shorten life expectancy? I knew we would be alright. For the next two weeks I watched the students dig deep into some really tough issues surrounding systemic poverty and its impacts on life expectancy. Most of the students were surprised, and maybe a bit disheartened at the kinds of things they were learning. For the first time many of the students were confronted with the uncomfortable fact that contrary to the narrative of the American Dream (work hard and you will go places), the location of a person's birth and the color of their skin likely are the factors that will most impact their life expectancy. Many students were horrified to learn that two people living a mere 5 miles apart can have a 25 year gap in the expected length of their life. As the students have worked these past couple of weeks I've had an eye over their shoulders, but in large part I've given them the freedom to explore and create.That's why I was floored today as I sat back to assess student presentations. Quick aside, throughout the semester students have worked on their presentation skills and on occasion we've raised the stakes a bit by bringing in evaluators from the professional world. Today we had the privilege of hosting Parrish Ravelli from YES! an organization focused on training youth for advocacy work. For two hours Parrish and I sat and listened to students present their findings and propose their solutions. Across all of the students' work major themes quickly emerged: racism is alive and well and education is the key to the future. These themes were addressed by the first two groups and found their way into the other 6 presentations. I was intensely proud of the grace with which the students approached these topics. Most adults would have difficulties engaging such topics in a meaningful manner. The students (all of whom are members of racial minorities), however, approached the issues with calm nerves and eloquent words. Rather than speaking from a place of hurt or pain, every group used data to support and advance their arguments. For many I am sure that it is the first time that they realized that America may not necessarily be as fair as they had thought that it might be. Or ... it is more likely that they were simply hearing spoken the things that they have already experienced. I wish that I was going to have the opportunity to debrief the presentations with the students. I would love to know what they were thinking and feeling as they worked through the project and heard the presentations of their peers. Personally, I was quite proud of them and their work; as I have been all semester. It's been a fun class that has tackled some very difficult issues directly and openly. I don't think that there is a student in the class that would say that they did not learn something through the course of our time together. To finish this post I would like to thank the class for a fantastic year, let readers know that I will be putting up a project highlights post soon, and direct you to our next to last installment of the week in review. Until all of those things are up I'll leave you with a little project teaser from Chanese Latta, Kristen Ellis, Maya Gouw, and Natalie Farrell. Finally, each student group was asked to create a solution to the problem of reduced life expectancy as a product of poverty. To my readers out there, is there a solution to be found?